Is calling Taiwan on your immediate to-do list? Next dial 866, the country code for Taiwan. Then dial the 1- or 2-digit area code (see sample calling code list below) and finally the 7- or 8-digit phone number. Note: Area code + phone number should total 8 digits except for Taipei and certain surrounding areas with 9 digits. Need more help with how to call Taiwan? 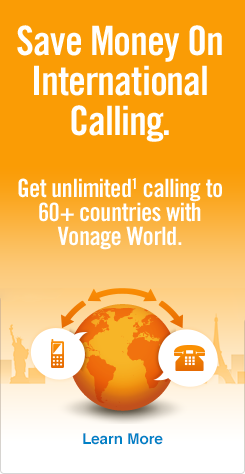 With Vonage World®, you’ll avoid expensive calling plans and calling cards while enjoying low-cost, reliable home phone service with unlimited¹ calling to Taiwan. For other great deals on cheap calling to Taiwan, view all our international calling plans. Either way, Vonage is your path to easier calls to Tawian! Don’t hold out! Share Vonage World with those closest to you, from Chung Ho to Hsinchuang. Just sign them up for a Vonage World account then ship a Vonage Box™² to them. Now they can make unlimited¹ calls to mobile phones and landlines in the U.S. Just imagine if your BFF in Fengshan had the same U.S. area code as you! Then you — and anyone else in the U.S. — can reach out to him through a U.S.-based phone number, instead of paying high international rates each time you want to call Taiwan. Even better — if you both have Vonage, calls are included. No additional charges between any of you. Plus, Vonage works anywhere there’s high-speed Internet! Are there any international calling apps out there?